Today is MLK day and we are all home, snug as a bug in a rug this cold, cold day. We didn’t have anywhere to go today, and so there was no reason to rush around this morning like chickens with our heads cut off (our usual Monday morning routine,) and I was able to enter the day a little more slower , and with a little more purpose and reflection. 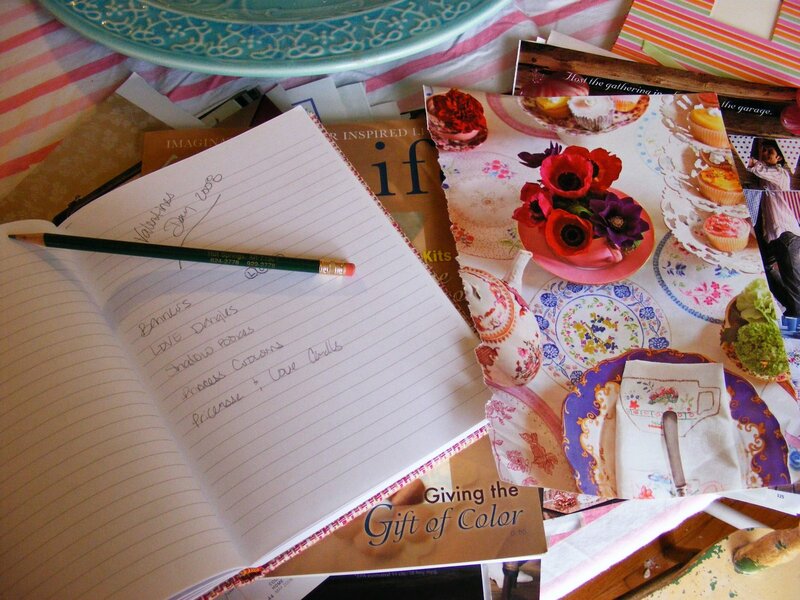 Inspired by Artsy Momma and Pam Garrison (in her Somerset Life feature) to pull out my Inspiration Notebooks, and by Katydiddys to take a moment to think and dream about my work and life, I had a nice moment this morning of inspiration and rejuvenation. I started weeding through the piles of magazines I have been collecting for years, taking out only the pictures I really find inspiring, beautiful or resourceful…I still have a huge pile to go through, but I am taking it one small stack at a time, so I can really decide what I want to keep and what I don’t mind passing along to someone else. 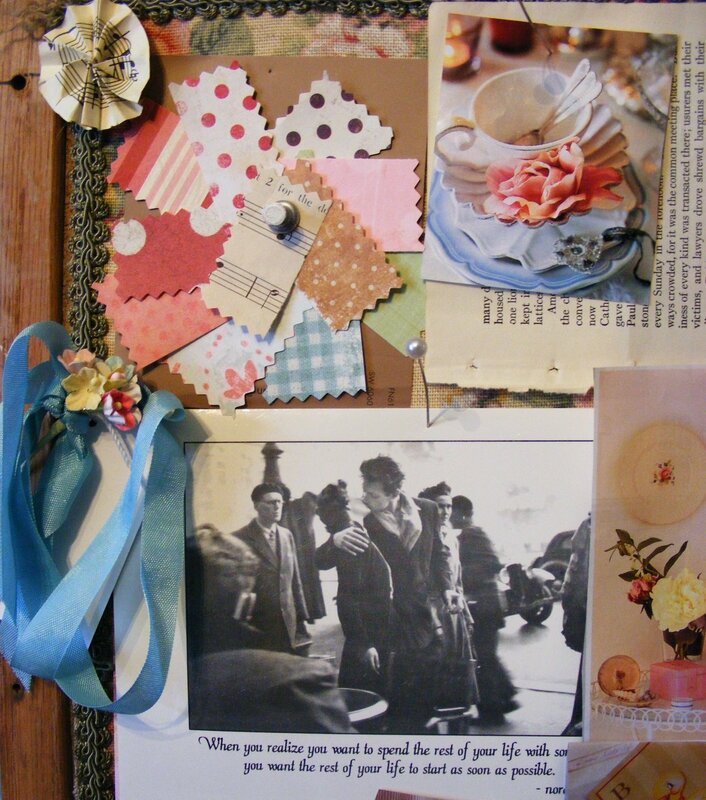 I also took a moment to jot in my design journal some deadlines and ideas for some submission projects I am working on, and I re-did my “Mood Board” for late Winter/ early Spring. Focusing on the theme of “Romancing the Day.” I even cut out pieces of the papers I am using in my Valentines and Easter collections and made a little color wheel out of them. Having the new board up and some deadlines set is great inspiration to get moving on a cold day like today. Now all I need is a warm cup of hot cocoa with a mound of whip cream on top and I am all set to enjoy my day of glittering! Notebook #1 was given to my by my sis Jemimah a few Christmas’s ago complete with picture sleeves and pocket folders and lots of good things for keeping my inspiration pics organized. 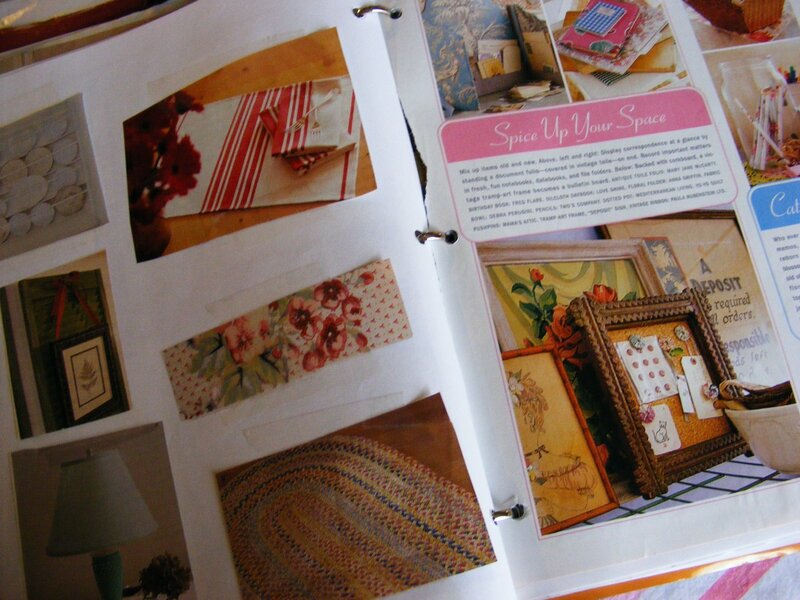 This book is full of lots of little pictures that are broken up into types of collages based on season or theme or color…. 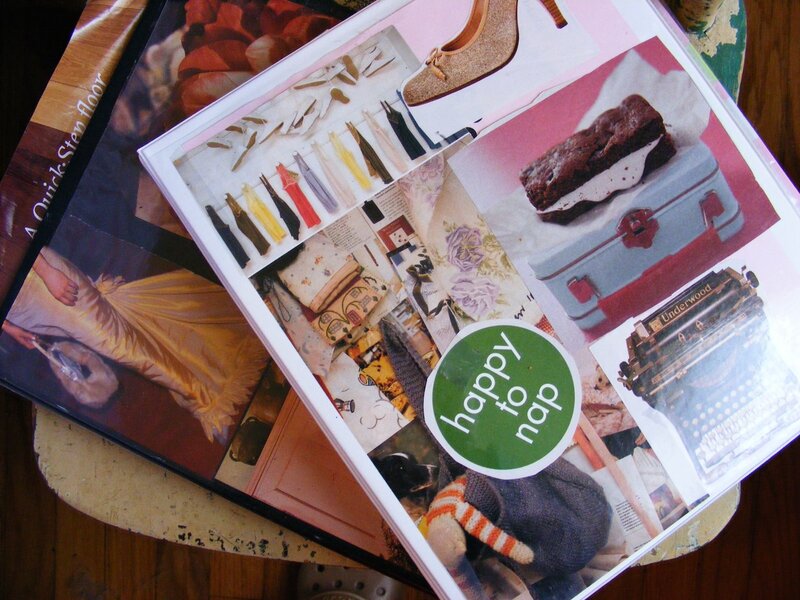 I also have lots of fashion and style snippets in this notebook as well. On the board: The black and white card is our wedding invitation. We took the post card made famous by the movie Singles and paired it with a great quote by Nora Ephron from When Harry Met Sally. I remember how worried my Grandmother was that people would be confused by the picture, wondering if that was Nathan and I…so cute! The couple kissing in the top right corner is my parents while they were dating. There are tons of pictures of them kissing, which I can only imagine my Uncle Terry must have taken, or that my dad set up a tripod for it… either way, I find them adorable and have stolen several from my grandmothers house…. Thanks for taking a minute to be inspired with me! I would love to know where you are finding your inspiration these days! 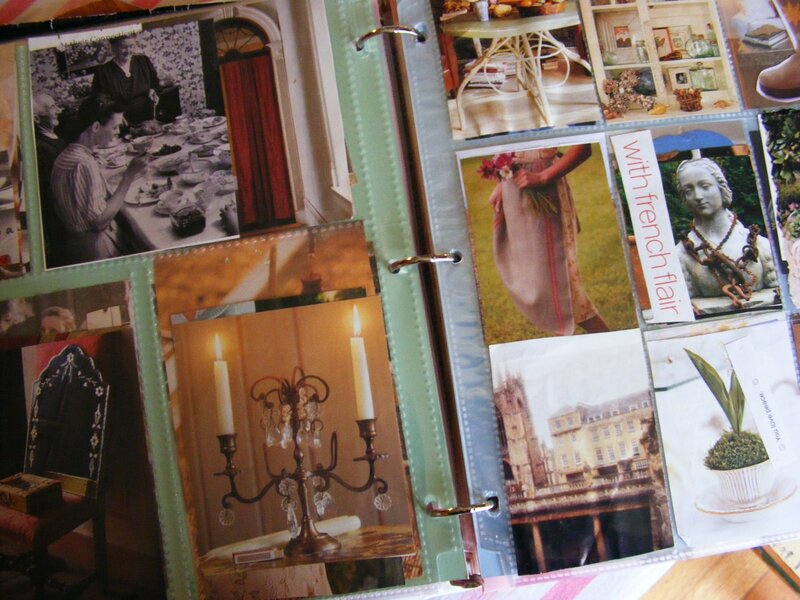 I love seeing what inspires others, especially the magazine articles and pictures they hold onto. Your wedding invitation is great, and your grandma sounds adorable! 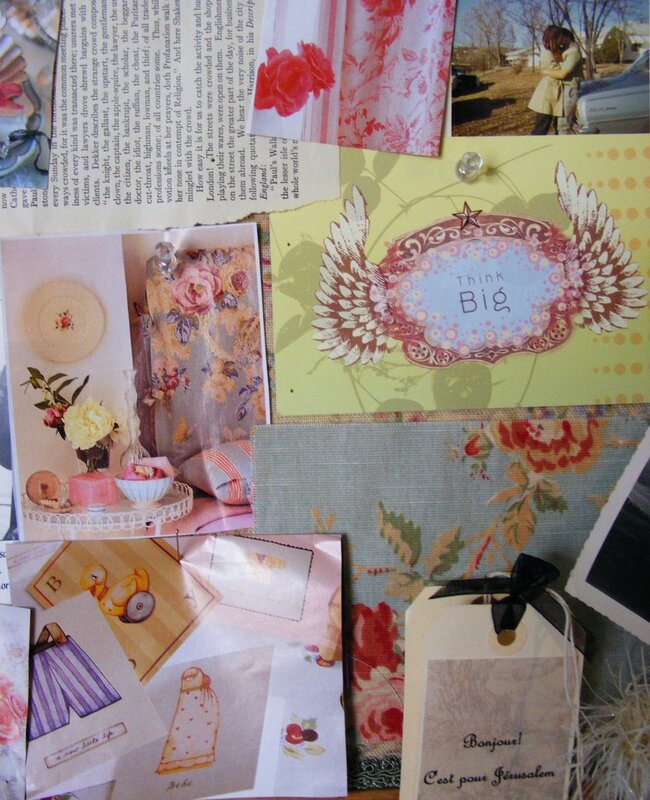 Love the ‘inspiration board’ idea.. may try that soon. Love all of your inspiration! I love getting that glimpse into what other people are drawn too. I love your paper color wheel also. I was just going through my magazine clippings on Sunday; cutting & downsizing in order to place into my inspiration binders. I’m trying to find a coffee table, which if you can believe, is no easy task for our teensy tiny town! I can’t find a single thing I like and am finding the internet very overwhelming. I wish I had kept more product & shopping guides from my various magazines. I’ve been looking on others’ blogs at their favorite shopping sites but still haven’t found just the right table. I’ve even widened my search to something other than a round table. If you can think of any good sites ~ please let me know! !Do you remember the first time I went to a slumber party at your house (6th grade ~ oh so long ago! ), and your dad came home & your parents kissed, and I was all ~ OMG, your parents are KISSING! I had truly never seen parents kiss up until that point, and it was a moment I will never forget. It changed my entire view point on marriage and the notion that romance does exist with parents. Lucky for them, my parents are now married to mates much better suited to them. when and where did you finally find somerset life around here. Beautiful dreaming! Glad I played a small part in inspiring you, considering you have become quite an inspiration to me.